What's This? I Miss Boston????? It's so wierd, but I miss the States. I especially miss Boston. I'm very happy to be home again, but once you've lived in more than one place, your heart is always torn between all these places. At least, that has been my experience. When I see images of the States, or, on the rare occasion, of Boston I feel this rush of nostalgia; okay maybe more like a steady trickle. When I first got to the States, I found many Bostonians to be brusque. This was a rude shock to me, being used to the chatty English and all. There was a somewhat, in my book, "crass commercialism" to America. If you could pay for it, it could be done. Money ruled. This was very different from "genteel England." In time, though, I came to appreciate this briskness of pace and the can-do attitude which prevails in many places of business in the States. England, by comparison, started to feel very old-fashioned and provincial. I also had GREAT difficulty getting used to the weather extremes- the summers where much hotter and longer than any English summer that I had experienced and so I loved them, the winters were hell on earth for me! Now, that I'm back home in Lagos, what I mostly miss from the States are my creature comforts, which I think I will get used to doing without over time. I also miss friends and places I used to spend a lot of time: Boston Common and the Boston Public Gardens; downtown Boston, with all the stores and restaurants and museums; the cinemas (though we do have a very fine one in Lagos at the Silverbird Galleria); the Malls (several of them); Dorchester where I volunteered (at PREP, the technology center) and visited many dear friends; my church and church family at the Cambridge Vineyard (discovered sadly just a few months before I left Boston). I miss walking and being able to leave my apartment without any particular destination in mind. Boston was a much tougher place for me to survive than England. I had almost no family when I got there and was not in the familiar school environment, so it was a lot harder to make friends. I think I mostly cherish my time in Boston, because it's where I can truly say that I became an adult (corny as that might sound, but very true). The tough times showed me truly who I was and could be. I'm due to start work next week and I'm so glad. I've had a two-month break from work and, much as I was looking forward to it, I'm very ready for it to be over. I also miss volunteering. I received an email from one of the staff at the community technology center (CTC) where I used to teach in Dorchester. In her email, she said that as they were preparing for the Fall term, she thought of me and had to write to say hello. Well, I miss the center too. I miss being involved in something that I care about and sharing my skills with others. I've even started forgetting a bit of HTML, believe it or not. I've been doing web development work almost everyday for the last 4 years and just two months away and I'm forgetting bits of code. I also wanted to learn how to build database-driven websites, which is what I started working on just before I left EDC. It's hard to practice this without a fast internet connection. I really don't want to lose all the skills I worked so hard to develop. I also don't want to lose sight of my dream to establish a technology-centered non-profit organization for women and girls; or at least work in that field. I would like to introduce some gender perspectives to the work I will be doing in my new job. I sincerely hope that is possible. Introducing people to technology and helping them develop their confidence is something that I've been interested in for many years and I want to continue doing that in some capacity. My new job is all about assessing technical skills among oil and gas workers and helping to come up with strategies and programs to address any shortfalls. I will know the specifics once I start next week. I can't wait. On Saturday, at the Silverbird Galleria, I saw a handful of women with locs (in one store alone!!!!!!). I've also caught sight of women with locs several places about Lagos. Of all the natural hair styling options, locs are the last one I would expect to see, because the Nigerian society is a conservative one, where Euro-centric ideals of beauty (i.e. straight, in-its-place hair) is still very much the norm. I have also seen a few Nigerian models sporting the very short and almost bald look. Wow! I feel suddenly not alone. I haven't seen anyone with long natural hair that isn't worn in locs though, so in that way I still get a lot of stares, but not as many as I expected to get. When my sister and I left the Silverbird Galleria and were getting into our car, there were two ladies in the taxi which had stalled alongside our car. As I got out of the car to give the gateman of the building in front of which we had parked some money (If you're not Nigerian, you probably won't understand why I had to give him any money. Actually, even I don't understand why I gave him any money, afterall he didn't do anything. Anyway, the tipping habits of Nigerians is another story). The lady in the front seat stared at me as I got out of the car and as I walked back to the car. I cannot stand it when people just stare at me- especially when I'm not sure it's out of admiration or anything like that. Then she asked me if that was all my hair, to which I replied "Yes, it is." "It's so lovely, it's so beautiful" she said. Blush, blush. :-) Unexpected compliments are so nice. I start work on Tuesday (Monday is a public holiday) and I think I'm just going to braid my hair with extensions. I've worn my hair out (i.e. in afros, afro puffs, twist outs) for the last two months and I need a break from my hair. Sorry, beloved hair. And so much for taking a stand for natural hair right off the bat. I'll have to do that later. - Television. The new season of programs would be starting about now and there are so many shows, which I was hooked on and will miss seeing: The Apprentice; America's Next Top Model; CSI. There are brand new shows, which I'd love to see: The Apprentice- Martha Stewart, Everybody Hates Chris. I was such a homebody in Boston, and especially in the winter, there was nothing I loved more than dashing home from work and cuddling up to an evening of good shows. Sniff. - Online Shopping. The older I've gotten, the less patience I've had for shopping in stores, but the more I've gotten to adore shopping online. Amazon.com was my favourite home away from home. I'd be listening to NPR or BBC at work (more about this later) and hear about a book or an author, and next thing you know, I'd be off to Amazon to check out said book or author. From there, I'd read the readers' reviews, check out what people who bought that book also bought and before you know it I'd have ordered 4 books. I had a wishlist all set up and loved seeing "Hello Oreoluwa" whenever I logged in to MY special page made up of all my most recent purchases or searches. - Online Radio. Everyone at my last job knew that I loved NPR and BBC. I was always listening to one of the two stations and now I don't know if I can work without accompanying sound. (Okay, I have no choice. I'll have to get used to it somehow). But, it was a great way to catch up on the day's news and listen to interviews with interesting people. There are a few other things I miss- I miss my friends a lot. I literally have two friends here. I hope this will change with time though. The wedding was great!!! LOL! NOT MINE!!!!!!! It was my best friend's big day. There was a civil ceremony on Saturday, at which I was a witness (and the closest thing ever to being a bridesmaid) and a church blessing on Sunday, at which I read the pre-requisite 1 Corinthians: 1-13 vereses. It was a big weekend for me, never mind the couple getting married. I really would like to have a small intimate ceremony whenever I tie the knot. With my family and being the first child, I don't see that happening, but we can always wish, can't we? I started salsa dance classes this week. I'm normally wary of making a fool of myself in front of others, but this time I didn't care so much. My sister and I went together and technically it wasn't our first class- we had a trial class a few weeks ago to see if this was something we wanted to invest time and money in. But, the instructor thought it was and was so impressed with how quickly we picked up the steps. Lol!!!!! After about 25 minutes of instruction, we practised to music. After this, we got to partner with the rest of the class (the intermediates and advanced pupils). This was a lot of fun. The great thing about Latin dances is that the men lead and so that takes a lot of pressure of me. It's also a great workout. What could be better- having fun learning something new and getting good exercise at the same time? We got back to Lagos about two weeks ago. It felt so good and "right" to be back- if that makes any sense. The traffic today, driving around Victoria Island and Awolowo Road in Falomo, almost made me change my mind though. But, traffic is a big part of Lagos. Everyone hates it and has to deal with it- and to think that I once complained about Boston traffic (shame!!!!). We tried out Salsa dancing last week at a place in V/I. It was fun. The music was very infectious and made me want to get up and let rip. Unfortunately, I was there was a first-timer and so there was no "letting rip" for me. I might sign-up for the classes next week. It's amazing all the things that there are to do now. Ayoola and I have been promising ourselves that we'll go to the Silverbird Cinema to see a film- I'm sure that there must be a lot of new stuff that I'm yet to see. We haven't made it yet. I have a wedding this Saturday and am looking forward to it, as it will be a very special wedding. Saturdays in Lagos hardly seem complete without two or three weddings. This will be my first. Europe was great! At least, what we saw of it. We ended our trip in London and stayed in a very posh hotel in South Kensington which was a really great way to cap off what had been a very fun trip. Since we arrived back in Lagos, we have been extremely busy. The day after we returned, we had to go to Abuja to pick up our NYSC call-up letters. Graduates of foreign universities have to pick up their letters personally from Abuja, to make sure that they really plan on serving out the year in the country. Personally, I'm not sure how that deters people from jetting out of the country for the entire service year, but there you have it. Two days later, we had to go to the NYSC camp in Iyana Ipaja to register. We got there around 11am, which was later than we had planned to get there. There were so many people at the camp and I felt a bit overwhelmed. My brother, sis and I started the registration process by completing the registration forms. The forms took about 25 minutes to complete- not because they asked difficult questions, but because there were so many of them and mostly asked the same questions over and over again. Sigh! As we filled out the forms on a set of tables in a corner near the corpers living quarters, someone a few floors above threw out a dishful of dirty water out of a window. Some of this splattered on my arm and mostly showered my sister. I sighed! Was the rest of our time there to be filled with such rude surprises? Mass commercialism, wherever and whenever, is the order of the day. Even though we were hassled about not having the correct ID cards when we first got to the camp, we later came across so many people who really had no legitimate business being there. For instance, as we filled out our forms, we saw several people with staplers, perforators, Tippex and other stationery. I soon realised that they were renting out the use of their implements for a small fee. Very enterprising, I have to say. A business with a very small start-up cost and infinite returns. But, of course, they must be paying someone for the right to be there. The line for the book of life was seemingly neverending and there were people who looked like they had been there for hours. Not encouraging for any newcomer to the line, but to assuage the thirst of any unfortunate souls on the line, a drinks seller hawked his wares by inviting people to "come and enjoy their money" with him. I cracked up when I heard that. I'm sure that over the coming year, I'll have more interesting NYSC stories to tell. We got to Barcelona last night and have mostly been shopping, I´m almost ashamed to admit. We did go to La Ramblas, which is a long walkway downtown with shops on either sides. There are also lots of cafes and restaurants of course and street performers. 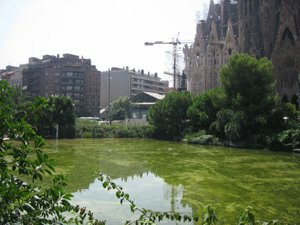 It´s very touristy and I remember reading Trip Advisor, in which many people recommended getting ahotel close to La Ramblas. I wonder why? I love our hotel, the Aparthotel Silver, which is 3 stops away on the metro. It´s beautifully decorated and very clean, which is a must with me. It´s also in a gorgeous neighbourhood. Why would anyone want to stay so close to the mayhem and crowds of downtown? My sister and I will go to see the famous Sagrada Familia and other places of note before we leave. We can´t say we came to Barcelona and the only thing we did was to shop. A partial view of Gaudi's famous Sagrada Familia from the park across the street. 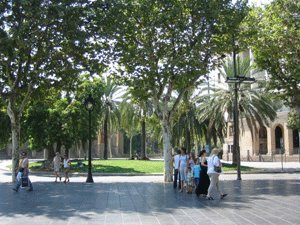 This is at the end of the Las Ramblas walkway, near the waterfront. 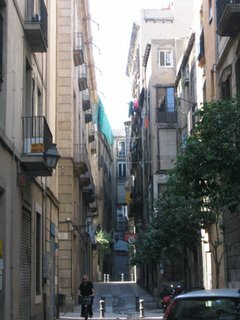 This is a view of apartment buildings in downtown Barcelona. 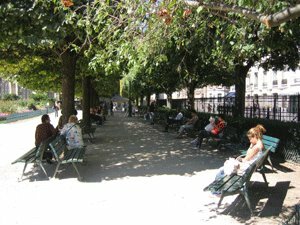 Paris in the Summer- Oui, Oui, Oui! I wanted to write more frequently than this, but we didn´t come across many internet cafes in Paris when we were looking for them, and then would find them when we were busy with something else. So, anyway, I haven´t written about the end of our Berlin visit and Paris. Paris was great! As soon as the taxi drove into the center of Paris, feeling the vibrancy and seeing people of diverse ethnic backgrounds as well as the beautiful Paris neighbourhoods made me come alive again. Berlin had been an interesting place to visit. There was something a bit too efficient about it for me. I think I have an affinity for places where things don´t work quite as they are supposed to. Well........ I´m not sure of that is true. I do like efficiency, so I´m not sure what it is. I met a guy who said that we MUST visit Munich and places closer to the mountains, which are absolutely beautiful. Our hotel in Paris was great. It was near the Bonne Nouvelle and Strasbourg St. Dennis stops on the Metro. It was also a very ethnically diverse area, which I loved. There were many shops and restaurants- you hardly needed to leave the area, but of course we did. On our first night, we went to the Gallaries Lafayette, which I supposed can be likened to Harrods or Selfridges in London, or maybe Saks in the States. I say this partly because it was an expensive store and Narcisso Rodriguez´s For Her eau de parfum and eau de toilette (which is my ab-so-lu-te-ly favourite perfume in the world!!!!!) can only be found in Saks Fifth Avenue in the States, which is a very expensive store. And I´m sure, if I checked, I would find it in Harrods and Selfridges. Gallaries Lafayette was beautiful. The main building had a breath-taking stained window dome roof. On the other days, we visited Arc de Triomphe, the Champs Elysee (which is a long street with shops on either side-basically), Place de la Concorde and it´s landmark obelisk, the Notre Dame and it´s garden, the Les Halles area (with it´s quaint shops and many restaurants), the Latin Quarter, Saint Chappelle and the Eiffel Tower. 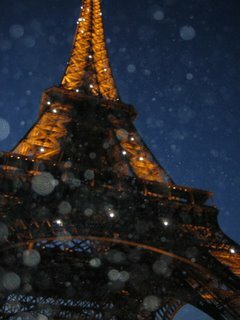 I think my favourite time in Paris (if I can choose just one) was the evening we went to the Eiffel Tower. It was our last evening there and it was an afterthought, like "How can we come to Paris and not see the Eiffel Tower?" So, we went there and took pictures. We then found a bench to sit on for about 40 minutes or so. I love summer evenings, because after the heat of the day you can enjoy the cool breeze and just enjoy seeing things wind down a bit. Around 9PM, when we were leaving, the infamous light show come on. I say "infamous", because although I hadn't even heard about it, I later found out that it's considered to be rather gaudy and tasteless. Flashing lights strewn all over the Eiffel Tower was the last thing I expected to see, so it took Ayoola and I totally by surprise. I loved it and apparently so did the rest of my fellow tourists. We all "oohed" in wonder and, for the next few minutes, the flashbulbs of our cameras added to the sparkles of light. The River Siene, taken near the Assemblee Nationale. This is the garden behind the Notre Dame. It was absolutely beautiful and my sis and I had a good doze there. The Eiffel Tower taken at night, during the light show.